Many Americans would rather read tax documents than turn their attention to a book based on history, much less one about a largely-unknown hero of the Revolutionary War. And since much of our collective aversion to this kind of reading stems from childhood experiences of being made to read brain-numbing and extremely dry school texts which we've been told are "good for you," it would seem to be an act of sheer lunacy to create an all ages comic on that topic and hope to have any kind of success, much less enthusiastic readership. Yet, that's precisely what Jonathan Meyers has committed himself to with his latest work, a graphic novel entitled Swamp Fox. Still, and against all odds, he's succeeded. His book was one of the highlights of the recent APE con in California, and now counts a large number of industry professionals, including Image Comics Publisher, Eric Larsen, among its growing legion of fans. Yeah, it is. Think Bone good, people. Swamp Fox is the real deal. Bill Baker: Why don't you tell us a little bit about Swamp Fox, both the book and the historical figure that inspired it? Jonathan Meyers: The Swamp Fox is a hero of the American Revolution. His true name was Francis Marion and he used tactics that he learned from the American Indians against the opposing British forces. His uncanny ability to meld in and out of the South Carolinian terrain without being seen earned him his colorful name. In the book we portray him as a wily, red fox; but in reality he was a French Huguenot that grew up in the Santee Valley. BB: In the book's foreword, it's mentioned that you basically came up with the idea for Swamp Fox at the Pittsburgh Comic Con in 2002. I get the feeling from reading the book, and bibliography and the description of the other Swamp Fox books mentioned at the end of this first volume, that there's probably a little more to the story of this project's creation. So where did your initial idea to translate Marion's story into a graphic format come from, what kind of development process --- conscious or otherwise -- did it need to go through, how long did that journey take ... and how different are the end results from what you originally envisioned? JM: True, there is a great more to the story than was explained in the foreword of the first volume. My grand father was a full blooded American Indian, originating from the Lene Lenape tribe. This heritage enthralled my boyhood and I discovered James Fenimore Cooper's Leather Stocking Saga. I loved the frontier adventures of Hawkeye and his native brothers. These stories left a lasting impact on my imagination. This was a perfect doorway to the stories of colonial America for me and upon my fascinating journey I happened upon the Swamp Fox and was amazed by him. It shocked me that America had an incredible hero who was on a level comparative to Britain's Robin Hood. I knew I had to let others know about him, because the man was so astounding. I toyed with the idea of making the story into a children's book and did a lot of conceptual paintings for it. The choice to tell it through animals was one part a desire to reach children with American history and one part an attempt to be original. There is no new story under the sun, but we can reinvent the way they are told. I think the story is so wonderful that it deserved more creativity than a fancy art style. Two of my friends Alexis Fajardo (Creator of Kid Beowulf and Plato's Republic) and Conley Philpott (Creator of Emeraude) saw my conceptual designs and convinced me to turn the story into a comic art format. I listened to their brilliance and set out to tell the saga of the Swamp Fox. 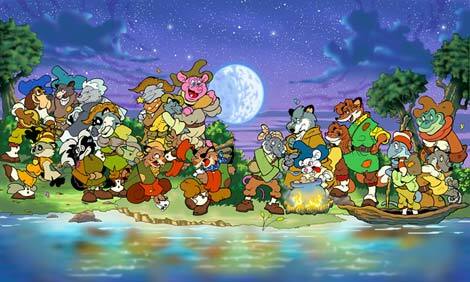 Early on I understood that this series would need to be approached as if it were an animated feature. I created model sheets, scale sheets, gesture sketches, expression charts, character timelines etc. Then my co-creator and wife, Lola, set out to thoroughly research the story, characters, costuming, politics, events, geography and period. This required reading books and articles, talking to historians and reinactors, and visiting a variety of locations. This part we found has never ended, we are still researching this project, as we create the further adventures of the Swamp Fox. I'm a perfectionist and I'm never satisfied with what I create, fortunately Lola keeps production moving or I'd still be drawing page one. The end result of the first volume I'm pleased with, but I'd love to change a half dozen things in it. BB: While it might seem natural to do a book in a "funny animal" style, given the name of the title character, I don't want to assume that it was a given for the book. Aside from the obvious reason, why adopt this style for the book? JM: I think that a person's first instinct would be to tell the Swamp Fox's story as a man, because of his Zorro-like mystique. I think given the comic culture's obsession with super heroes this choice would be the more prudent and obvious choice. My desire to tell it using animals was a conscious desire to tell it originally and bring more creativity to the story development. I will admit that I loved Don Bluth's The Secret of Nimh as a child, and this greatly influenced my drawing style and the look of the series. BB: How did you assign the different animal identities to the various characters? For instance, why make the British troops rabbits? JM: I'll admit assigning animals to signify different peoples and characters was the most fun part in creating the Swamp Fox world. I admire Professor Tolkien's mastery in developing Middle Earth and took my cue from him. I wanted to create an involving and layered anthropomorphic society. I made the American colonists field animals, of which the red fox is considered a part, because I felt that this decision would best describe the diversity of the American people. It is America's cultural melting pot that makes her so strong and resilient. The British I made rabbits, because they are the natural prey of the fox. This choice was more simplistic, but I felt that it added an effective depth to the Swamp Fox world. The French I made cats, the Hessians are German Shepherds, and the Native Americans are represented as wolf and coyote packs. The choice of animals also comes down to their personal attributes, an example is George Washington. He was made a mountain lion to represent his strength, nobility, and natural ability as a leader. BB: I don't think I'm going out on a limb by saying that this book seems to be designed for an all ages audience, and is a perfect means to getting kids not just reading, but reading about American history. Given that there's a lot of violence, implied and committed, in the story, was the adoption of the cartoony style also a way to grant you the leave to depict that violence in a straight forward manner and not worry about upsetting or offending the reader ... or am I reading a little too much into it? JM: Not at all, I think the Looney Tunes or Saturday morning western approach was my direct way to deal with the horror of war. I mean war is a messy business and I didn't want to mislead a young reader that its all fun and glory. Sure I could have blasted off limbs with cannon balls and had blood spurting across panels, but why? I think that younger readers will get that war is a very real thing, without stuffing their faces in the gore. I'm a school teacher and I'm around kids everyday. They are at the fore front of my thoughts when I draw these stories, as are their parents. I think I have a responsibility to my audience, regardless of age, and this belief fuels my creative decisions in all aspects on this project. 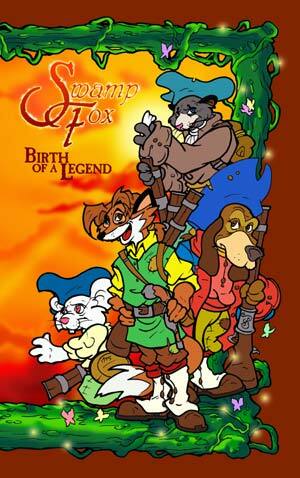 Swamp Fox is definitely all ages in its nature, because young and old can learn something from the story itself. BB: How is a typical Swamp Fox book put together? Do you and Lola create a full script, or perhaps just a rough plot outline, and then you start drawing ... or is it looser and more intuitive than that, and you just start drawing and see where you go? JM: I definitely spend a lot of time developing. This is probably due to my background as an illustrator. In illustration you'll due several sketches before you settle on a final composition. Its the same when creating Swamp Fox. First Lola and I review our tentative outline, which is heavy with historical facts. We then search for character development, subplots and potential creative twists. This often calls upon us to discuss and even act out the scenes together. We then compose them into a more composed plot, and then Lola weaves them into a script. I then take the script and read it. I then resubmit it to Lola for corrections. We argue a while, and then we come to a script we are both content with. It is at this stage that I draw detailed thumbnails and finally pen out my final drawings. I don't pencil pages like traditional comic illustrators. I create singular drawings in pen and compose them into the panels. This is done with the help of a light box, after which I ink my pages. I have developed this creative process, because it works efficiently for my wife and I.
BB: This first volume, subtitled Birth of a Legend, takes us only so far in Marion's transformation from British loyalist into American Revolutionary and folk hero. What's next, and how many volumes do you think the entire saga will occupy when you've finished telling this story? JM: The next book we're releasing this May, and it is a prequel called Swamp Fox: Swamp Tails. It will chronicle the many adventures of young Francis Marion from his days as a sailor, to his exploits in the French and Indian War, and finally to his final moments before he becomes a Revolutionary War hero. The second volume in the Swamp Fox Saga will be called Swamp Fox: Spirit of '76. Birth of a Legend introduces the Swamp Fox, where as the second volume will show you what the Swamp Fox can do. He is called upon to help defend Charleston, South Carolina from a British invasion from the sea. Meanwhile the Continental Congress is torn by the issue of independence, and whether or not America can beat the greatest empire in the world in a full scale war. We have seven core stories developed in the saga, but who knows what tomorrow will bring? BB:: As I noted earlier, you've got a lot of ancillary books planned to compliment this project. Why don't you tell us about those books, what you hope they'll add to the mix, and give an idea of when they might be ready? JM: We will be doing the prequel, and another called The Silver Madonna which will involve Roger's Rangers. Then there will be the seven key volumes which will focus intimately on Marion's many adventures. I figure we will probably see two volumes a year, and more if all goes well. We are very excited about these stories and love what we're doing. My colorist, Mike Sturgulewski, said the other day, "Man, I can't wait to get working on the next adventure". I think this excitement we have for the Swamp Fox will make each volume something special for the reader. BB: Sounds like you've got some big plans for Marion and company. Are you going to be looking to launch Swamp Fox in any other media in the future? I mean, this thing's just begging to be animated! JM: That's our plan here at Ambition Studios. 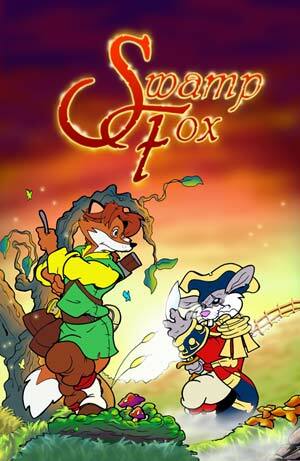 We want to see the Swamp Fox's adventures animated. I've gotten some positive contacts so far, but nothing solid yet. I'm working on an animation bible in my spare time, so we'll see what the future holds. BB: Well, you just mentioned your studio, Ambition Studios. What led you to create Ambition, what kind of benefits do you get from being part of that entity, and -- hey, you knew it was coming! -- can anyone else join up, or is it by invitation only? JM: Ambition Studios was started as an artists' support network. We push each others' projects, and encourage each other in tough times. Its really nice having friends who'll watch your back. We are always looking for new talent, stories, projects etc. This industry needs a new ideas and fresh faces to help her press through the rest of this decade. We're hoping this studio can help in the process. So, sure send in your projects, if we like it we'll help print and push it. I think the true benefit I've received is the encouragement, advice, and inspiration I've received from other artists. That is more valuable than any publishing conglomerate can offer. BB: Anything else that you'd care to add before I let you go? JM: Yes, our website is www.swampfoxcomic.com and you can buy the graphic novel through our website there. Ambition Studios will have a booth at this years Pittsburgh Comicon, so try to find us there! If you're interested in learning more about Swamp Fox, or buying this truly fine book, head on over to Jonathan's site at www.swampfoxcomic.com and check it out. And don't forget to grab a copy for those kids and adults in your life who think that comics ... or history ... are boring. 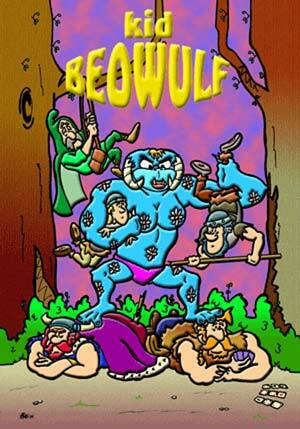 This is the kind of book that can open up a whole new world to readers of all ages.